KING’S LYNN have secured Norfolk-based Poultec as their title team sponsor for the 2019 Premiership season. They will now be known as the King’s Lynn Poultec Stars after the training specialists agreed to increase their involvement at the Adrian Flux Arena. Poultec are a national apprenticeship training provider, who cover key sectors including engineering, agriculture, business and management, hospitality and catering plus many more as well as their own Speedway programme which enables riders to develop skills both on and off track as they form their racing careers. The training specialists are also proud sponsors of local riders Jack Thomas, Connor Mountain, 2017 World Champion Jason Doyle and the Poultec Stars skipper Robert Lambert. Managing Director Ed Bales said: “It’s such an honour and we’re really proud to be linked even more heavily now with King’s Lynn Speedway. “Our association with the club goes back to the beginning of the century and we’ve met some great friends through the Stars. “We’ve been helping the club out and sponsoring riders for about 15 years so to now be the main team sponsors is the icing on the cake you could say. “King’s Lynn is a professional, well run club and it’s one that strives for success year on year. 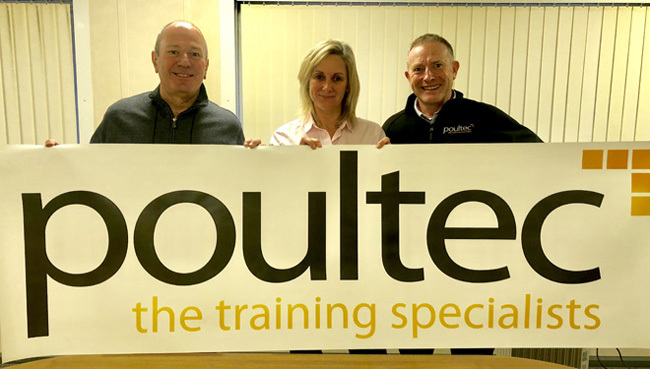 Meanwhile club Co-promoter Robin Brundle said: “We’re absolutely delighted to welcome Poultec on board as our new main team sponsors, and we’re thoroughly looking forward to working even closer with them in 2019. “Ed and his team do a fantastic job in Speedway, they’ve been friends of King’s Lynn for over 15 years and our brands are perfectly aligned. “They do some outstanding work with youngsters, especially within Speedway, and as I say they align perfectly with how we function as a team at King’s Lynn.